This rousing and rocking complete live show from 1982 finally affords Clash fans the full concert experience. The Clash were one of the greatest bands of the punk and new wave era, and they tore up many a stage during their reign. Surprisingly, few official documents of the Clash's live prowess have surfaced over the years. Considering the band more or less dissolved in 1983, it's incredible that it was 1999 before From Here to Eternity: Live emerged. A good sampler culled from Clash concerts from 1978 to '82, it is nonetheless a somewhat dissatisfying experience. While the CD enabled listeners to hear the Clash's live talents, it didn't supply that absorbing feeling of having "been there." Finally, Live at Shea Stadium fills that void. During the fall of 1982 -- on the heels of what would be the real Clash's last album, Combat Rock -- the band played a series of shows opening up for the Who's reunion tour. Live at Shea captures in warm, full, and punchy sound the second of two nights the bands played in Queens, New York, at the recently-demolished home of the Mets and (at that time) the Jets. On October 13, 1982, the Clash played 14 songs in just under 50 minutes, as befits a warm-up act. However, based on the excitement of the crowd and the group's intensity, the Clash don't come across as a mere opening act. As The New York Post reported at the time, "there were as many Clash fans on those nights as Who fans." The evening's fever-pitched ambiance is established during the 70-second introduction from longtime Clash associate Kosmo Vinyl. He rouses the crowd and pulls the mood above the inclement weather, barking in a thick Cockney tongue, "You ain't worried about no rain! Rain's a lot of rubbish!" Moments later, the Clash launch into the epic guitar stabs that kick off the title track from their greatest album, 1979's London Calling. Thus begins their super-charged rock show. Along the way, the band play a smattering of everything from their career. 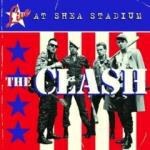 While their studio albums progressed from punk to reggae to new wave -- and included many genre diversions -- Live at Shea Stadium is pure rock 'n' roll. Given the headlining band, the Clash were probably wise not to venture into any of the tripped-out dub of Sandinista. That release's "Police on My Back", though, is a charging blast of energy. (Strangely, the opening guitar riff is altered to sound just like the beginning to U2's "I Will Follow", but that's a minor distraction.) Early punk-era cuts like "Career Opportunities" and concert closer "I Fought the Law" have been honed by the band, with their original garage-born buzz replaced by the wallop of a confident, practiced band. The Clash's professionalism is probably best exhibited by tracks six through eight, where a brisk reading of "Magnificent 7" drops midway into a slower-paced "Armagideon Time", which segues right back into "Magnificent 7 (Return)". Though executed flawlessly, the medley choice itself is pretty weird. Fortunately, most everything else on Live at Shea Stadium works quite well. "Rock the Casbah" is stripped of its Atari-era sound effects (save for one full-bodied bomb drop) and is transformed into an aggressive guitar-based rocker. It fits well alongside superbly performed and generally more straightforward cuts like "Train in Vain", "Tommy Gun", and fellow Combat Rock single, "Should I Stay or Should I Go". One would expect such unadorned songs to sound good live, so it's a bit surprising that the fairly uncomplicated "Clampdown" doesn't translate particularly well. Still, it's the only effort here that tastes a bit sour. The press release for Live at Shea Stadium argues for this album's inclusion in the pantheon of classic live LPs. Does it join James Brown at the Apollo and Johnny Cash at Folsom Prison, as Sony would like us to believe? No. It's a step below those all-time greats. Shea arrives a quarter-century too late to achieve such status. Part of what made those other concert LPs classics is that they were issued while the respective acts were still at their peaks. They became essential components of the artists' discographies. In 25 years, perhaps this excellent live document will acquire the mystique of the Clash's studio work and will be seen as the definitive live statement from an undeniably great band. For now, at the very least, Live at Shea Stadium is a very welcome addition to band's already superb catalog of albums.